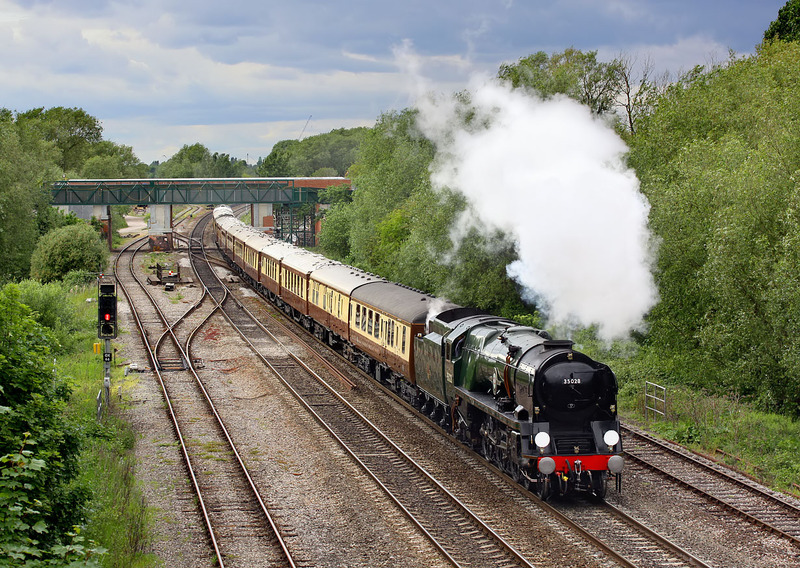 Under threatening skies, Merchant Navy Class 4-6-2 35028 Clan Line passes Hinksey Yard, near Oxford with the 1Z87 17:51 Oxford to Victoria VSOE special on 14 May 2011. For the second time in two days I found myself being the only photographer taking a photo of a steam special, something that would have been unthinkable a few years ago (unless you had walked miles from the nearest road). I had thought the previous day's occurrence was a fluke, but despite (or perhaps because of) the fact that this is from the Oxford by-pass, I expected someone else to turn up. Neither is there anyone on the new road bridge in the background of this picture, although I suspect, unlike its predecessor this bridge is probably photographer unfriendly!